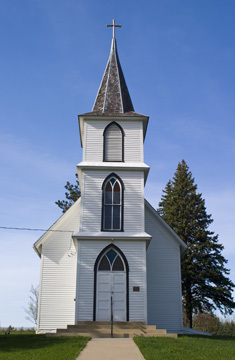 Christdala Church is located in Forest Township on Rice County Highway One, two miles west of Millersburg, Minnesota. The Church and its surrounding cemetery are prominently situated on one and one-eighth acres of land on a hill overlooking Circle Lake to the south. The building is original, constructed in 1878, and has never been moved or altered. Today, the Christdala Church is listed on the National Register of Historic Places, though is no longer an active congregation. The structure and cemetery are maintained by the Christdala Church Preservation and Cemetery Association and continue to reflect on the distinctive contributions that Swedish immigrants made to the community and to early Rice County and southern Minnesota history. The Christdala Church Preservation and Cemetery Association is a Minnesota-based non-profit corporation established on September 20, 1994. Contributions are tax deductible under IRS Code Section 501(c)3. The primary objective of the corporation is to restore and maintain in unaltered and original condition the Christdala Church and Cemetery to preserve the heritage and legacy brought to America by Swedish immigrants who established Christdala.